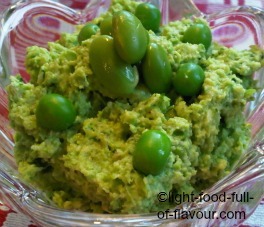 At times I swap a typical hummus made with chickpeas for a green broad bean hummus (fava bean hummus). 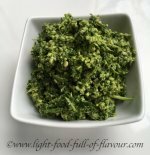 Broad beans take a bit of time to prepare – but they are worth it! Apart from being delicious, broad beans are really low in fat while rich in protein, dietary fibre, folate and several minerals including manganese, phosphorus, zinc and magnesium. They also contain a fair amount of iron but it is non-haeme iron – which is mostly found in grains, legumes and plant foods. Non-haeme iron is much harder for the body to absorb than haeme iron found in meat and fish. If you eat food rich in non-haeme iron in combination with food which is rich in Vitamin C – such as sweet red peppers (bell peppers), broccoli, peas, berries, citrus fruit, peaches and papayas – it will help your body to absorb the iron. In this green broad bean hummus the peas contain a fair amount of vitamin C but try adding even more vitamin C by eating it together with raw red pepper (bell pepper). Try it on some toasted sourdough bread. It’s delicious! I should say that I used to make this hummus with edamame beans - immature green soya beans. In the photo above, the beans on top of the hummus are edamame beans (very photogenic). The problem with soya beans is that a lot are from GM-crops and I, along with so many others, believe that it is best to avoid GM-food as much as possible. 1. Place the broad/fava beans in a pan of simmering water and cook for 2-3 minutes if fresh, 5 minutes if from frozen. Drain and then cool the beans under cold running water to stop them from cooking any further. Once cool, peel off the skin of each bean (the skin slips off easily when you pinch the ends). 2. Place all the ingredients for the hummus in a food processor and whizz together.